Two Michelin Stars awarded Bord'Eau offers a culinary adventure directed by Executive Chef Richard van Oostenbrugge, who is announced by 'Gault Millau' as 'Chef of the Year 2014'. Exceptional ingredients are blended to create symphonies of flavour, all complemented by the finest wines from around the globe. 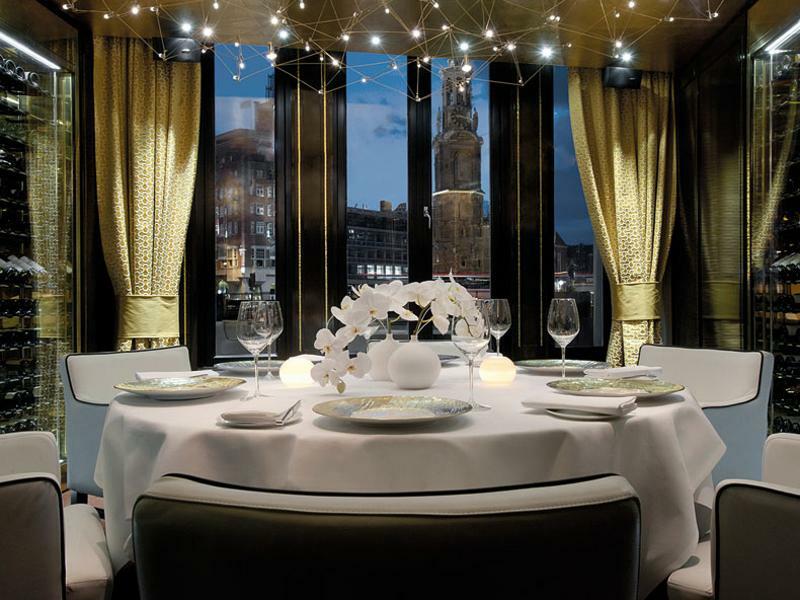 The intimacy of the salon-like setting, the classical simplicity of the decor and the grace and attentiveness of the service suggest high style and privilege overlooking the Amstel River. For more intimate occasions, Bord'Eau offers an exclusive Private Dining room for up to twelve guests. "Walls of Wine" featuring outstanding selections from Les Caves De L'Europe, the hotel's impeccable wine cellar, create a timelessly glamorous cocoon in which savour Bord'Eau's signature creations. Les Caves De L'Europe is the hotel's wine cellar, and is long considered among Amsterdam's best with over 1,000 selections from the old and new worlds which expertly pair with a sumptuous meal. Head Sommelier Dannis Apeldoorn, noted by the Huffington Post as one of the world's best palates, "curates" the selections, and created a dynamic wine program where guests can enjoy tastings, tours and interactive seminars by appointment.